As South Florida Wedding Photographers, we document love in all its various forms at wedding venues, ceremony sites, and reception halls across Dade, Broward, and Palm Beach counties, mainly focusing on photographing happy couples from Vero Beach to Jupiter to Ft. Lauderdale. West Palm Beach, Boca Raton, Palm Beach Gardens, Pompano Beach, Palm Beach Island and Delray Beach are just a few of our favorite nearby cities that offer spectacular photographic opportunities in our local area. Slightly outside of our home area, Miami and South Beach are unique and historic locales recognizable the world over. Add in Monroe Country, encompassing all of the Florida Keys and a large swatch of the Everglades, and Collier County with its crown jewel of Naples and our area becomes even more geographically diverse. For a South Florida wedding photographer or any photographer in general, it’s easy to see how many varied locations, landscapes, and architecture can provide stunning locations for portraits and events. From late October to the middle of May, our photography studio is based in Jupiter, Florida. Consistently rated as one of the top ten seaside towns in America, Jupiter has been Steve’s hometown since moving here from Hollywood, FL in 1990. He attended Lighthouse Elementary School and Jupiter Middle School before becoming a Warrior at Jupiter High School, graduating in June of 1999. During that time, the community of Abacoa was planned on the southern edge of the town of Jupiter with construction beginning in 1997. Steve attended college at the Jupiter campus of Florida Atlantic University near the Harriet L. Wilkes Honors College. He earned his accounting degree in the same spot where he used to pick strawberries two decades earlier. Recent expansion of the area includes the Scripps Research Institute and the Max Planck Institute for Neuroscience, adding to Sikorsky Aircraft Corporation and Pratt & Whitney as big name employers in the region. This has contributed to steady population growth, specifically in relation to year round residents. Wedding venues are plentiful in Jupiter and Jupiter Farms, as well as in the surrounding town of Juno Beach, village of Tequesta, and city of Palm Beach Gardens. Jupiter Beach Resort is an iconic hotel overlooking the Atlantic, across from the Maltz Theatre at the end of Indiantown Road. Multiple ballrooms, a restaurant, and hotel rooms with sliding glass doors leading our to private balconies add to the charm of this landmark near the Jupiter Lighthouse. The recent development of Harbourside Place brought with it dining, shopping, intracoastal docking, and a showpiece hotel, the Wyndham Grand Jupiter at Harbourside Place. With five restaurants within walking distance, including The Woods Jupiter owned by golfing legend Tiger Woods, Wyndham Grand Jupiter offers wedding guests and vacationers a centralized location for a weekend of festivities. As a wedding venue, the Mangrove Deck offers a second story view of the waterway and potentially some impressive watercraft docked below. From a photographer’s viewpoint, the beige walls and floor provide a natural bounce for light in the otherwise direct and intense South Florida sun. Golf and Country Clubs are frequently booked as wedding venues as they often offer indoor and outdoor locations, both of which are desirable in the South Florida area. Jupiter Country Club cover both indoor and outdoor locations by spanning the north and south side’s of Jupiter’s main road. A ceremony location near the pool juxtaposes manicured landscapes with the natural thicket of native plants and trees behind a manmade waterfall, leading into a fountain. On the north side of Indiantown Road, the restaurant at the terminus of the Jupiter Country Club golf course is well equipped for dinner and dancing. Close proximity to both Interstate 95 and the Ronald Reagan Turnpike make for easy access to one of Jupiter’s newest wedding venues. Nestled at the southern tip of Jupiter Island, the Jupiter Inlet Colony is a tiny town of fewer than 400 people. Jupiter Island is synonymous with some of the wealthiest people in the country who own estate, mansions, and compounds up and down the barrier island, some of which have properties that extend from the intracoastal waterway across the thin strip of land to the Atlantic Ocean. Exquisite weddings held at luxurious private residences on Jupiter Island can feature weddings guests arriving via yacht or couples landing in privately owned helicopters. The Jupiter Inlet Beach Club can host weddings that enable simultaneous views of the ocean, the Jupiter Inlet, the Loxahatchee River, The Jupiter Lighthouse, DuBois Park, the DuBois House, and all of the boating traffic that passes through the inlet daily. We photographed a wedding at the Tequesta Country Club after a ceremony in St. Christopher’s Church and a stop on the way back on Bridge Road. Hobe Sound is the first populated area north of Tequesta, separated Jonathan Dickinson, a large state park with nature trails, and observation tower, and biking paths. Bridge Road connects Hobe Sound to Jupiter Island and it known for its ficus trees, which connect above the road to create a canopy that looks like a tree tunnel from both ends. One of the most photographed tree tunnels in South Florida, Bridge Road is worthy of a stop with or without a camera in hand. The quaint village of Tequesta is mainly residential but it does contain a short stretch of US 1. Stop by Oceana Coffee on the way through town for a cup of java and a rotating photographic exhibition on the cafe’s walls. For weddings in Palm Beach Gardens, there are major chain hotels that offer their services for your big day, including the Hilton Garden Inn Palm Beach Gardens, Doubletree by Hilton Palm Beach Gardens, the Palm Beach Gardens Marriott, and the Palm Beach Marriott Singer Island Beach Resort and Spa. A line of hotels, condos, and timeshares dot the coastline of Singer Island, the stretch of land between Palm Beach Island and Jupiter Island. MacArthur State Park is also on Singer Island, just north of the line of buildings but south of Lost Tree Club. MacArthur State Park is one of our favorite local engagement session locations, in addition to being a well preserved part of Florida’s ecosystem. A long boardwalk from the visitor’s center to the beach stretches over the Intracoastal and offers a peaceful walk, but there is a tram if you would prefer to get to and from the sandy beach a bit faster. Renting kayaks and canoes to take out on the protected waters can offer glimpses of manatees, an assortment of birds, and the occasional dolphin. Many of the upscale Palm Beach Gardens weddings we photograph are at golf and country clubs, including the world-famous PGA National Resort and Spa. We often forget that such a world class facility is just a few miles down the street from us, but seeing it sporadically pop up on ESPN during golf tournaments is a good reminder. When the Honda Classic is underway each March, we hear our friends and fellow photographers vying to score a ticket to The Bear Trap, which is 15th, 16th, and 17th holes of the course. Named in honor of Jack Nicklaus and denoted by a plaque and statue, this three hole group is considered one of, if not the most challenging stretch on the PGA tour. We enjoy it for completely different reasons as photographers, since it’s a wonderful backdrop for wedding or engagement photos and we get to drive the golf carts around the entire course. While not frequently used as wedding venues, the occasional nuptial at a private club or golf course can be quite the unique event. Old Palm Golf Club weddings and weddings at Ballenisles, both in Palm Beach Gardens, have provided us enough happy memories to always make us smile when we drive by the entrances to the gated communities. Add in Mirasol, Lost Tree, and Seminole Golf Clubs and there are opportunities around seemingly every corner in our area. Frenchman’s Reserve, the younger sister community of Frenchman’s Creek, is a more approachable wedding venue to the public and advertises as such. Admiral’s Cove on Alternate A1A is welcoming the public to its impressive clubhouse and has welcomed us as photographers on multiple occasions. Old Marsh Country Club is directly west of Eastpointe Country Club and both offer the exclusive feel so many brides seek in a wedding location, both for the ceremony and reception. On the Northern end of our home area is the town of Vero Beach, which is emerging as an up and coming wedding destination on the Treasure Coast. The anchor here is the Vero Beach Hotel & Spa. Located directly on the ocean, the elevated patio space provides a tree lined ocean vista that can serve as a ceremony location that is mere feet away from the air conditioned reception space. We have also photographed a wedding on the prestigious Orchid Island at a stunning private home, but the Orchid Island Golf and Beach Club is more naturally suited to hosting gatherings the size of a typical wedding. Bent Pine Golf Club, Grand Harbor, and Oak Harbor Club are all wedding options exclusive to Vero Beach, but Disney is getting in on the fun now as well. Disney’s Vero Beach Resort is close enough to still be affiliated with Orlando an easy hour drive west and the Disney Cruises leaving from Cape Canaveral, but Vero Beach provides the space that is close enough, but still far enough away to feel like a destination. Jensen Beach is halfway between Jupiter and Vero Beach and is home to The Mansion at Tuckahoe, a historic wedding venue unique to South Florida. Also known as the Leach Mansion or simply Tuckahoe, this former private home built in 1938 for the heiress of the Coca-Cola fortune and her husband, Willard Ransom Leach. The building was used as a college and as a campus for the Florida Institute of Technology. Today it is arguably the premiere wedding venue for the Treasure Coast, offering views of the Indian River Lagoon from an elevated position atop Mt. Elizabeth, an ironically named archeological site that, much like the Mansion itself, it now on the National Register of Historic Places. The history of the location has led to a reports of abnormal, bordering on paranormal activity, including haunting piano music, creepy singing from a small boy who isn’t there, cold spots, and unexplained sensations. We chose to get married at Sumner Mansion, a historic home in Hartland, Vermont that had its own associated ghost stories, so we have a special place in our hearts for this South Florida counterpart in Jensen Beach. West Palm Beach is the largest city fully encompassed within our home area so it unsurprisingly has the most wedding venue options. Despite being separated by only a small span of water, Palm Beach and West Palm Beach are vastly different cities. While often conflated, Palm Beach is the more exclusive, residentially oriented island just off the coast, while West Palm Beach is an urban center of over 100,000 people. West Palm Beach is divided into smaller neighborhoods, many of which have achieved distinction on the National Register of Historic Places. Places like the Bel Air Historic District, Grandview Heights, and Central Park all have their charm, but three others stand out to us. El Cid, between Old Dixie Highway and Flagler Drive, has hosted many a getting ready space for our weddings, via AirBnB and Home Away. The historic Mediterranean homes in the El Cid neighborhood have a classy, old Florida feel unrivaled in the area, save for the region across the street. Flamingo Park, like its neighbor El Cid, used to be a pineapple plantation around the turn of the 20th century. Located on the west side of Old Dixie, this is the most up and coming area in the region, with new shops and restaurants opening monthly. We have photographed Show Yourself Portrait sessions in the historic homes and gardens that line the tree covered small streets throughout Flamingo Park and are enchanted by the potential photo opportunities it could provide for wedding days. Old Northwood Historic District has turned around completely over the past few decades, with street art and artisan restaurants that feels like a northern version of Wynwood right here in Palm Beach County. Central Palm Beach County is home to a few small hamlets like Lantana and Hypoluxo and a few larger towns like Lake Worth and Boynton Beach, but the tiny town of Manalapan and its 33462 zip code has the distinction of being the priciest in the United States. If you’d like the distinction of getting married in the fanciest of towns, Eau Palm Beach Resort & Spa is the place for you. Matching the area in which it is located, Eau Palm Beach Resort & Spa has achieved a Five Diamond rating from AAA and has three different ballrooms from which to choose, including the Grand Ballroom, Plaza Ballroom, and the Ocean Ballroom. We have worked at Eau in the past, including doing promotional work for the spa itself, which allows us to personally attest to the high level of professional service provided. Delray Beach is home to a few of our favorite spaces, including the group of properties associated with The Seagate. The Seagate Hotel & Spa is just a few blocks from the beach down Atlantic Avenue, home to many of Delray Beach’s best hotels and restaurants. In terms of getting ready spaces and meeting locations for guests, Seagate Hotel & Spa is a leisure oriented, luxury boutique resort. Around the corner and down A1A is the Seagate Beach Club, the site of many a great wedding and our favorite best man speech of all time. As it usually simultaneously operates both a fine dining restaurant upstairs and a casual restaurant downstairs, the Seagate Beach Club is positioned as an ideal, beachfront reception room. Floor to ceiling sliding glass doors open up to a covered patio space where guests can enjoy the ocean breeze while not being subjected to the blazing sun from above or strong winds from the side. To round out the trifecta, The Seagate Country Club at the Hamlet boasts a championship course, decor inspired by the best of Bali, and a recently renovated ballroom. Western Delray Beach is the site of the Morikami Museum and Japanese Gardens, one of the most photographically intriguing wedding venues in South Florida. Photographing a wedding at the Morikami can feel like the surroundings were designed specifically for our lenses. A walk along the trail through the varied landscapes includes a bamboo forest, rock gardens, a koi pond, and plenty of giant iguanas scurrying along the grass or looming on a tree branch overhead. The Morikami Museum, specifically the Japanese Gardens, is one of the best places in South Florida for us as professional photographers, as it can be the backdrop for weddings, engagement photography, or even family sessions as you see repeatedly throughout our portfolio. We like taking our house guests to the Morikami, as does our current president, who brought the Japanese Prime Minister and first lady here during a state visit to Mar-a-lago. When we think of Boca Raton weddings, our minds go to the natural pairing of The Boca Raton Resort & Club with The Addison. The Addison on Camino Real is a former restaurant that has become a full time catering and event venue. Named for its architect Addison Mizner, this former estate constructed in 1926 still contains the massive and original banyan trees in its courtyard, now over 100 years old. The intimacy of the setting, the history of the building, the customized amenities and those unforgettable banyan trees all combine to make the Addison the most distinctive wedding spot in Boca Raton. Only a mile down the street is the Boca Raton Resort, or more commonly called simply the Boca Resort. A Waldorf Astoria Resort, it boasts eleven restaurants, Mediterranean styling, and rooms facing the ocean, the Intracoastal, or both. Just for good measure, it has been rated at the top spa in the country by Conde Nast Traveler’s Readers’ Choice Awards. Crossing south into Broward county, Deerfield Beach is a large population center, but the smaller towns of Lighthouse Point and Hillsboro Beach are situated on either side of the Hillsboro Inlet. At the tip of the peninsula, the Hillsboro Inlet Lighthouse and its distinctive black and white color scheme looms large on the horizon. The Hillsboro Club is adjacent to the lighthouse’s land and offers a wood deck abutting the sand, providing fantastic photo ops during a ceremony. The cabins and rooms across The Hillsboro Club’s property allow brides and grooms to prepare for the day either together or separately, and proffer a myriad of first look locations, many of which can implement views of the Hillsboro Inlet Light. We began a recent wedding season with energetic and lovable clients here, and the entire day reminded us of why we love being South Florida wedding photographers. With I-595 being the southern terminus of our local area, The Bonnet House Museum & Gardens is one of our top southern places to capture images. There is a fee for photography if you choose to have the grounds as the setting for your engagement photos, but as it is just a few blocks from Fort Lauderdale beach, we highly recommend it for its lush gardens, beautiful trees, and variety of locations. The Bonnet House has been an institution in the area for decades, as Steve remembers visiting it as a child. Having the opportunity to go back as a photographer allows him to take in the entire place from a new perspective. If you choose the Bonnet House as your wedding venue, you and your guests can stay nearby at places like Hilton Fort Lauderdale Beach Resort, The Ritz-Carlton Fort Lauderdale, The W Fort Lauderdale, or one city over in Steve’s birthplace of Hollywood, FL, at The Diplomat Beach Resort. Miami weddings are outside of our local area and therefore require an additional travel fee, but we still book plenty of wedding photography clients for their events in Miami and Miami Beach. Iconic hotels like The Fontainebleau Miami Beach and The Eden Roc Resort will always provide photographic opportunities for us based on their status as epic and historical Miami Beach institutions. Newer venues like the Cruz Building in Coral Gables have a history all their own, even if it began in a different city and the building was physically relocated across state lines. Classics like The Deering Estate and Vizcaya are for those who literally want to get married at a place straight out of the movies. Focusing on establishments that market themselves as wedding venues may be the usual path, but if you’d like to take the road less travelled, we’re more than happy to work and any park or natural area, and there are two important ones right outside of Miami in Biscayne National Park and Everglades National Park. Even farther south are the Florida Keys and the rest of Monroe County. 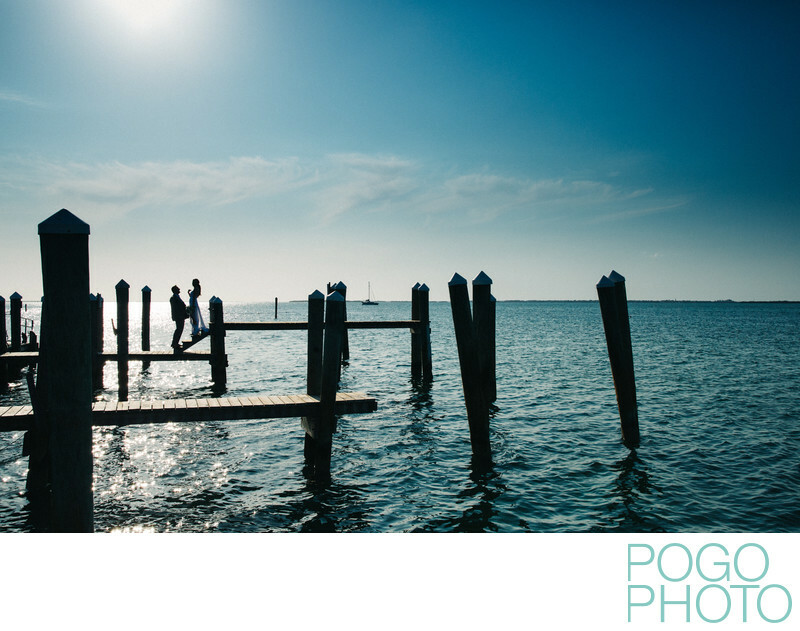 We have already photographed couples in Key Largo, Islamorada, Marathon, and Key West, but in our book Little Palm Island reigns supreme. The Keys have a feel all their own, usually intertwined with deep sea fishing, colorful sunsets, copious amounts of alcoholic beverages and the ridiculousness the is Duval Street in Key West. To maintain aspects of that charm while integrating it into a pristine, high class setting on one of the most beautiful, secluded private islands in the United States is a challenge nowhere but Little Palm Island could pull off properly. Casa Marina and The Hyatt Centric Key West are worthy counterparts, but we cannot compare either to our experience as guests and photographers of a Little Palm Island wedding. South Florida is not just limited to the east coast of the Sunshine State, as Ft. Myers, Sarasota, and most notably Naples provide the same Floridian feel as the Atlantic coast, but with a Gulf Coast vibe. The Naples Bay Resort, a four star hotel along Florida’s Paradise Coast, is just a few blocks from the shopping destination of 5th Avenue South and a short drive from numerous beach access points where you can bask in the sun or enjoy a sunset over the Gulf of Mexico. A reasonable drive across Alligator Alley from Miami International Airport, the Gulf coast of Florida is more easily accessible than many on this coast believe it to be. The attitudes of the locals more closely mimic those of the midwest, as a larger percentage of seasonal and permanent residents hail from states like Michigan, Illinois, and Minnesota. This can be a welcome, and sometime surprising change of pace from the hustle and bustle of multicultural Miami or the heavily New York influenced areas like Boca Raton. Enjoying experiencing all of these destinations as South Florida wedding photographers has proven to be delightful, but the real thrill is coming across a new and uncharted place to make new memories and create lasting images of connections, love, and emotional moments. Location: Little Palm Island, Florida. 1/5000; f/8.0; ISO 800; 33.0 mm.